It must be election time again in Oldham as the Labour Council adopt the living wage as policy on the 1st April 2015 after years of promoting low pay in Oldham as a selling point to attract new businesses to Oldham. 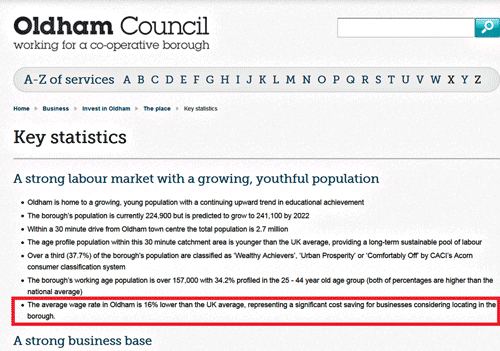 The picture on the right was taken from Oldham Council’s website and the information remained online until June 2014 when the average Oldham wage was actually 20.2% below the national average wage. Agents trying to sell industrial units at the planned Foxdenton industrial park, of which Oldham Council are partners, have lifted the pay information directly from the Oldham Labour Council website & are still advertising low pay in Oldham as a positive selling point of the scheme to businesses.